Dry British aka Steve Millington is an illustrator, expert sign writer and engraver. 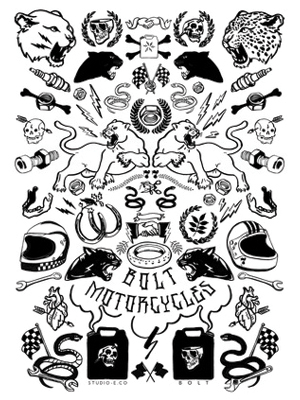 Dry British's solo exhibition at Bolt includes screen prints, risographs, sign-writing and hand painted helmets and leathers. Em Prové is an Illustrator, Fashion and Surface Print Designer for brands including Acne, Barbour, Lavenham and Farrah. Em has produced a limited screen print, t-shirt and scarf. 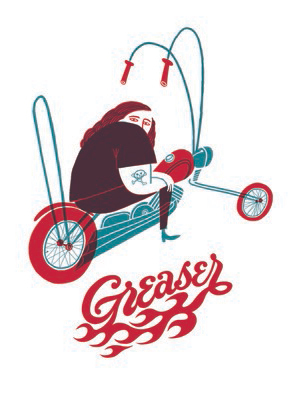 Steven Burke is an illustrator, artist and independent graphic designer based in the south of France.